Twenty-eight Republicans hold student loans compared to 25 Democratic colleagues. Despite fewer debtors, Democrats paid more overall for school, with their student loan liabilities totaling more than $1 million to the Republicans’ $830,000. Sixteen members with student loan debt are in their first term. House members with student loan debt exceed Senate members. Only three senators cataloged student loans. However, a formatting difference between the two chambers’ financial disclosures gives more insight into the duration of senators’ loans. Democrat Christopher S. Murphy, the junior senator from Connecticut and graduate of the University of Connecticut Law School, recorded student loans set to term out by 2027 and 2028, while Colorado GOP Sen. Cory Gardner will likely be on the hook until 2031 after attending the University of Colorado Boulder Law. Both will be in their mid-50s when the debts are repaid. Six members have more than $100,000 in student loan liabilities. At the top of that list is outgoing House Oversight Chairman Trey Gowdy. The South Carolina Republican listed over $150,000 for a dependent child’s education starting August 2015. 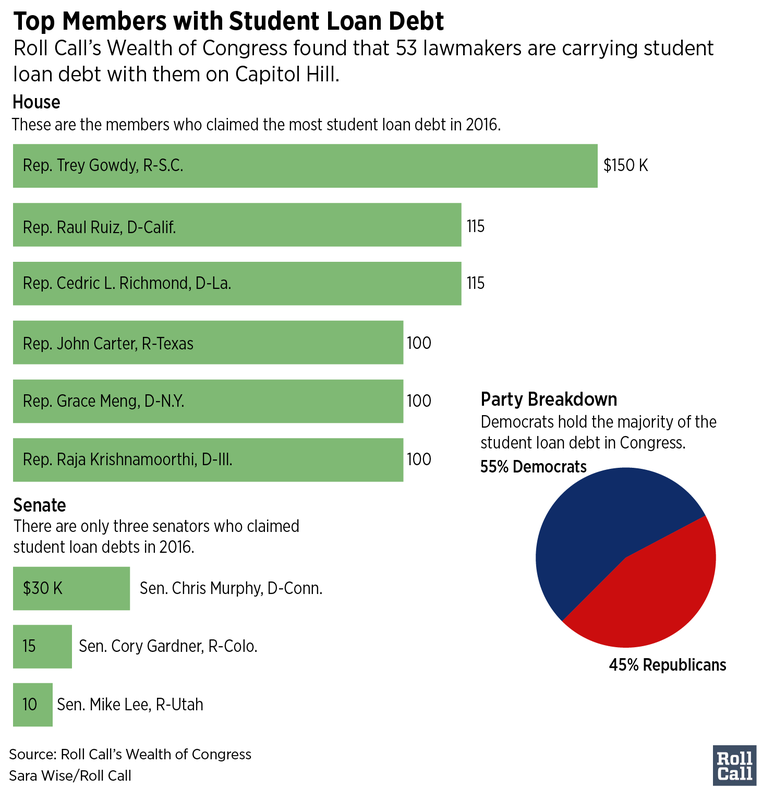 Rep. John Carter has paid for student loans the longest. The Texas Republican owes more than $100,000 on loans incurred in 1988. Though he did not specify, Carter’s loans may be related to his now-grown children’s education. Others are responsible for many years of advanced degrees. California Rep. Raul Ruiz received an M.D. and two master’s degrees in the early 2000s from Harvard University. Ruiz is paying for at least $100,000 in debt. His wife, Monica Rivers, an emergency-medicine nurse, also incurred student loans, bringing their educational debts to more than $115,000. How much is it costing them? Ten members of Congress ranked as millionaires even with educational liabilities. Rep. Ro Khanna listed $50,000 in student loans, next to an estimated $28 million in family holdings. “I certainly have been very blessed and fortunate in my own life that I’ve been in a position where the loans are not crippling … but there are a lot of people who don’t have that opportunity,” the California Democrat said. The same is true for Massachusetts Democratic Rep. Joseph P. Kennedy III. Twenty-five thousand dollars in his spouse’s student loans pale next to his trust fund of more than $19 million. Student loans have driven some members into the red. Arizona Rep. Kyrsten Sinema posted no assets with a dollar value, while a single student loan liability put her in negative net worth territory. Her fellow Democrat, Rep. Eric Swalwell of California, has more than $50,000 owed to EdFinancial after receiving a law degree from the University of Maryland, giving him -$53,999 in net holdings. Most members use federal student loan repayment services or educational institutions to finance educations, but four members sourced from private creditors. Democratic Rep. Brendan F. Boyle of Pennsylvania lists Citibank and Discover as his debt collectors. First-term GOP Reps. Andy Biggs of Arizona and Lloyd K. Smucker of Pennsylvania owe student loans to Wells Fargo Bank. California Democratic Rep. Mark Takano said he lowered his federal loan interest rates with SoFi, a personal finance company that offers student loan refinancing. Younger members hold more student loan debt than their older colleagues. This trend could be attributed to rising college costs along with older members successfully paying their financial commitments. Only two members with debt were born before the end of the Second World War: Carter and Missouri Democratic Rep. Emanuel Cleaver II. Neither is paying for their own education. Only three of the 18 baby boomers with student loans appear to have financed their own education — all were past 30 when they took out the loans. Generation Xers in Congress are the most in debt both for their own education, the education of a family member or both. A quarter of all Generation X lawmakers listed student loan debt, while none of the small sample of millennial members did so. Four Republicans and three Democrats on the House Education and the Workforce Committee have student loan liabilities. Murphy is the only senator with student loans to serve on the chamber’s Health, Education Labor and Pensions Committee. Takano, a House Education member, is still paying back loans after borrowing more than $40,000 for a 2010 master’s degree from the University of California, Riverside. The change in ability to repay loans stands out to Takano, who borrowed a maximum of $15,000 for a bachelor’s degree in the early 1980s. Takano is concerned rising student loan debt will preclude students from having the same opportunities to serve. “I don’t understand how young people who have to take out loans closer to $40,000, some $80,000, depending on [the] school … can become teachers or work in the public service arena,” he said.